I’ve been away from this blog for a long while, I hope everyone has had a lovely Christmas and managed to relax with whoever you wished to. 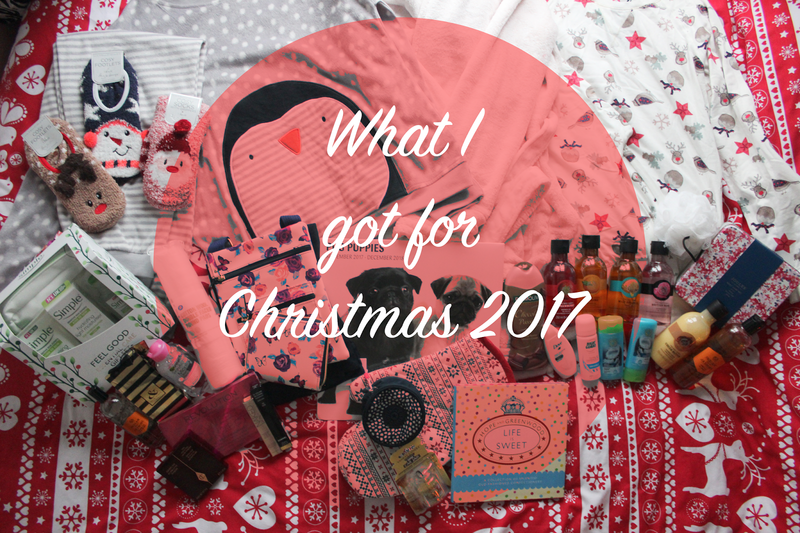 I thought I’d come back and do a what I got for Christmas post, including the usual disclaimers. 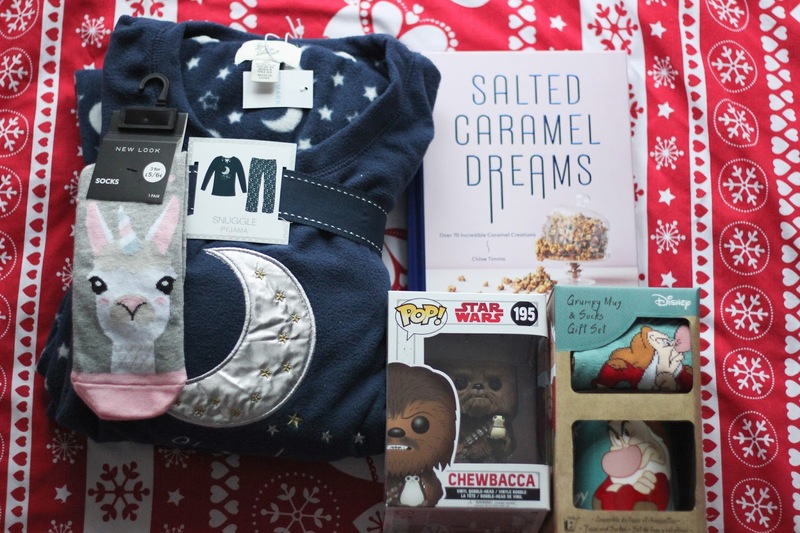 In no way am I boasting, I’m purely writing this because I love reading what I got for Christmas posts and I know there are a few others that do too. I am so grateful for all the gifts I’ve received and the time I’ve spent with loved ones over the Christmas period. Unfortunately for blog photos the weather wasn’t great on Christmas Day, but I did my best! 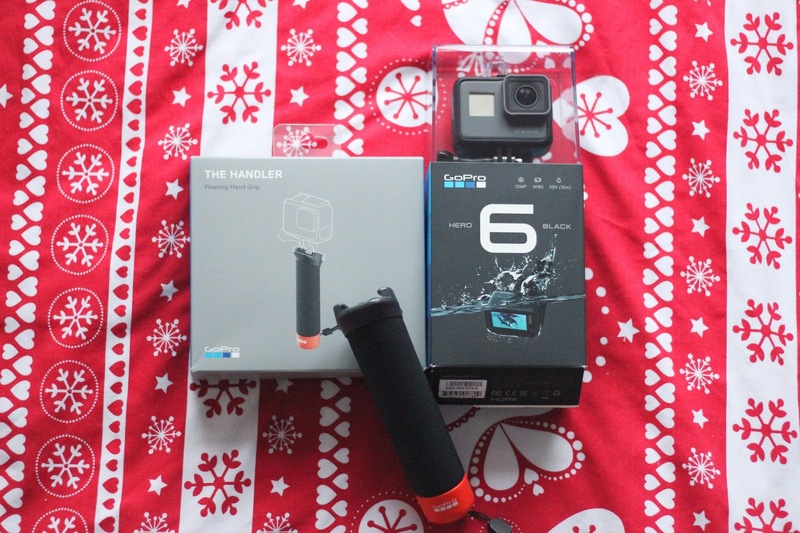 The present I was most surprised to receive this year was a GoPro Hero 6 from my boyfriend Rhys, he must be listening to me more than I think he does! This was such a thoughtful gift because he knows that I take my DSLR everywhere with me, and he said he thought this would be easier, it would be great for events and also when we go on trips. I am still so shocked that he bought me a GoPro, I’m so grateful and I’m currently loving testing it out. To go with my GoPro, his parents bought me the floating grip for it, which is perfect for keeping the camera stable, for panning shots and also it will be perfect for our holiday next year. 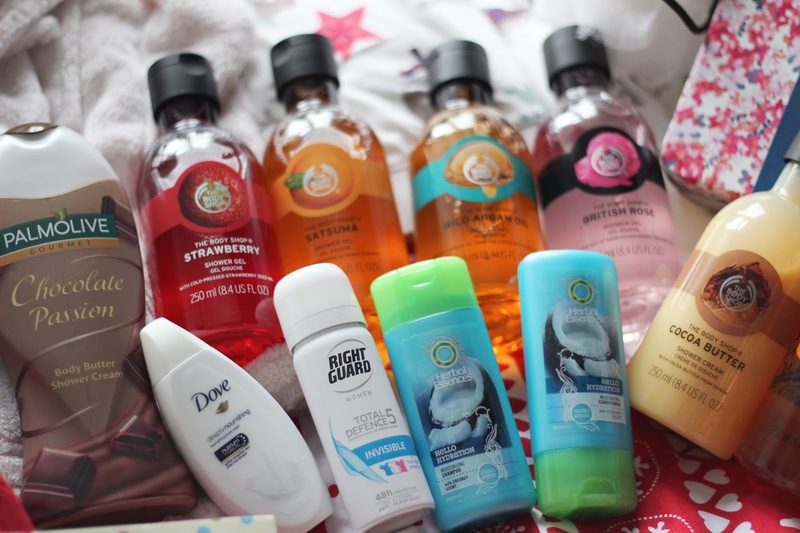 I think this is the first year anyone asked me what I wanted and I actually asked for shower gel. I can’t get used to being a student and not working full-time, so needs must! My friend Katy bought me four shower gels from The Body Shop, in my favourite scents (which was a lucky guess!). My friend Emily also bought me an Indian Jasmine shower gel from The Body Shop, my friend Danielle bought me a chocolate scented shower gel and I also received another shower gel from The Body Shop from work, so I’ll be all set for showers for a long time. My friend Herrington bought me a few travel minis and a shower puff, these will come in handy when staying over anywhere overnight. Rhys’ sister bought me the most amazing Lush gift set, I was so happy to receive this as Snow Fairy is one of my favourite Lush scents. Rhys’ grandparents bought me a L’Oreal SerieExpert Shampoo and Conditioner set, which I am so excited to use to get super soft hair. 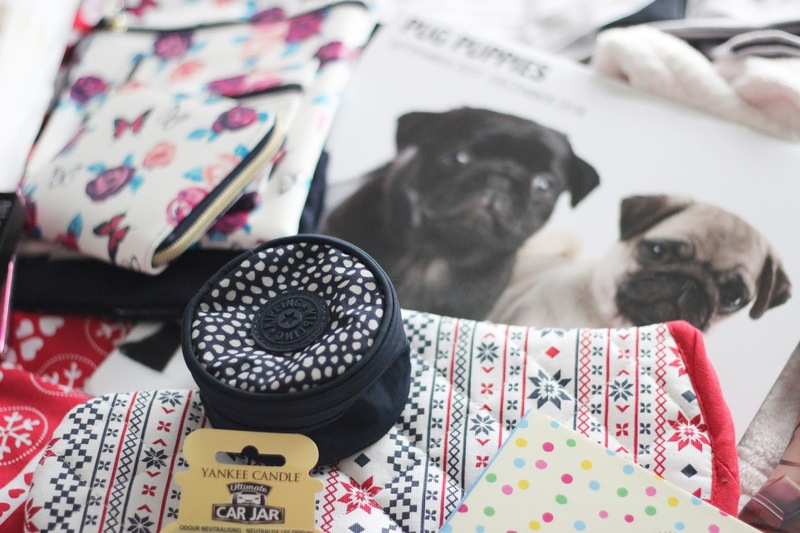 My sister also bought me a Joules gift set which comes in the prettiest tin. I also got a few gift sets to make sure my lips get through these winter months and stay super soft. 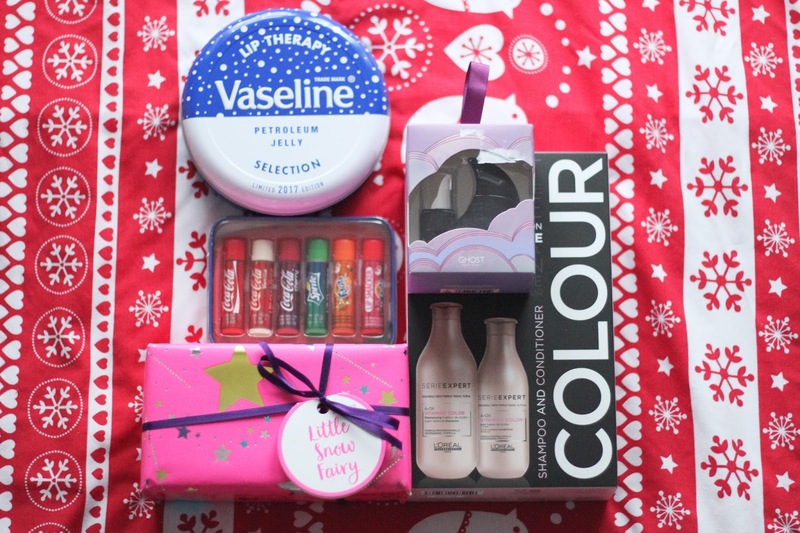 Rhys’ parents bought me a Vaseline tin with three tins of different Vaseline in, and Rhys’ brother and his wife bought me a set of Coca Cola Lip Smackers which will be great to pop in my handbag. I was in serious need of pyjamas for winter because mine were so old and literally falling apart. 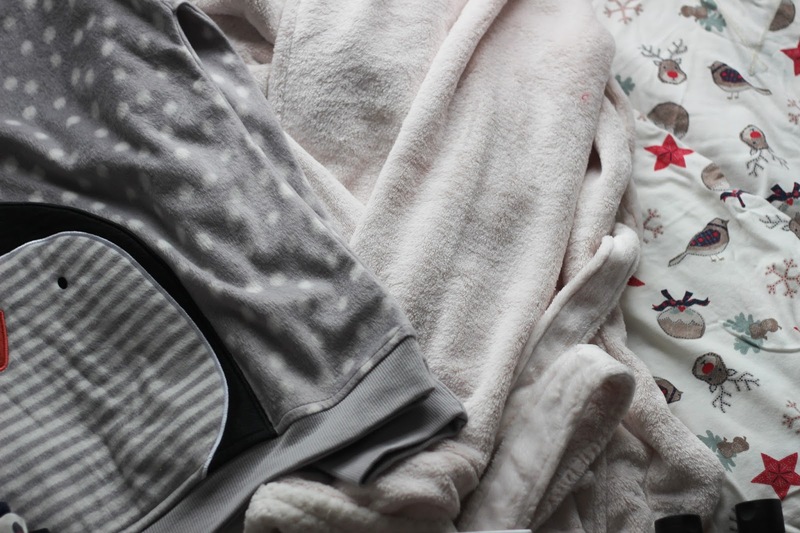 Luckily I received a few pairs for Christmas this year, which I am so grateful for because they’re keeping me so cosy in my cold room! 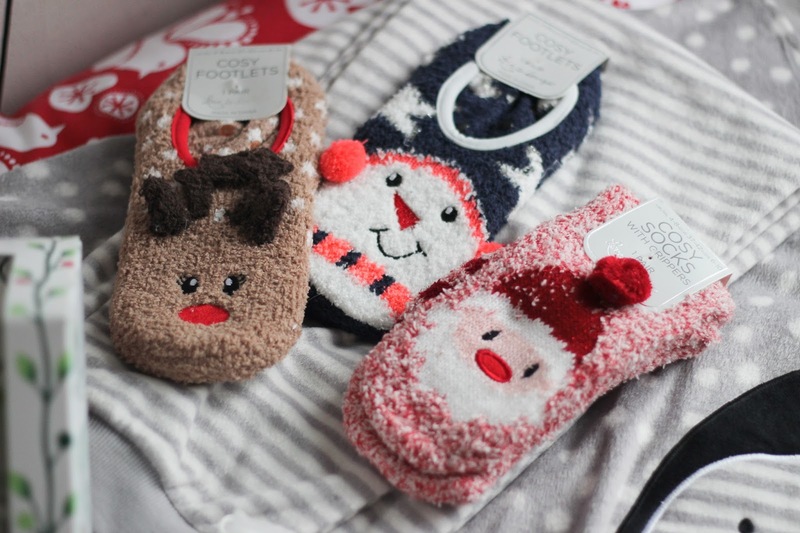 My Mom bought me a Christmassy pair from Debenhams which I am in love with. My Auntie & Uncle bought me a pair from M&S which have a penguin on (which is amazing anyway) but they are so warm and cosy, much like the pair Rhys’ sister bought me from Primark, which are keeping me so warm currently. I’d been wanting a new dressing gown for so long (mines quite old and isn’t very soft) and my brother bought me one from FatFace, which is the softest one I’ve ever felt. My brother’s girlfriend bought me some cosy footlets and socks from Primark which are perfect for my constantly freezing feet. Rhys’ parents also bought me unicorn socks from New Look which are adorable. 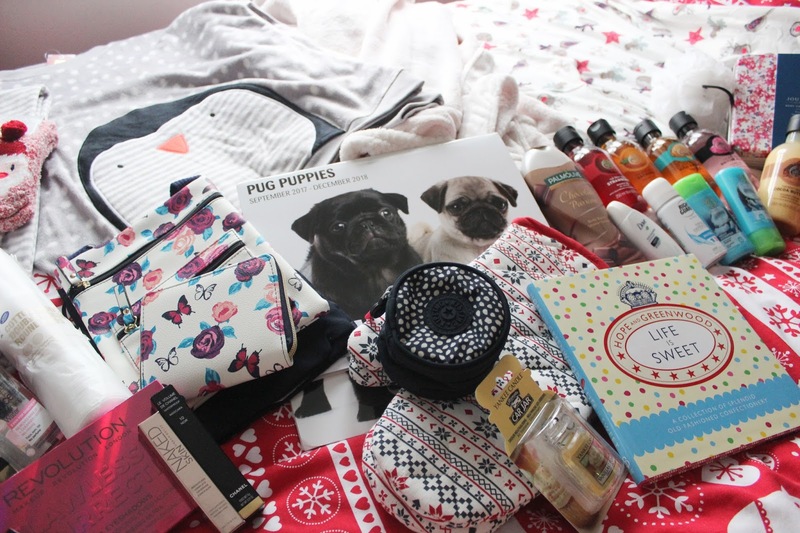 All of these presents I had no idea I was getting and I love all of them. My Mom bought me the classic present of a 2018 calendar with pug puppy pictures, which is adorable. My Auntie & Uncle bought me a bag, purse and scarf set which is lovely. My other Auntie & Uncle bought me a Kipling accessory pouch to go with the pyjamas they bought me, which is perfect for when I’m travelling or stopping over somewhere and want somewhere to put my jewellery (or SD cards and camera batteries). I got a few baking related items because everyone knows how much I love baking. My friend Chloe got me a book called ‘Life is Sweet’ which is full of old fashioned sweet recipes, I’m really looking forward to trying some out. Rhys’ sister bought me the ‘Salted Caramel Dreams’ book which is obviously full of caramel recipes, I can’t wait to try these recipes out because caramel is so tasty. Finally, my Secret Santa at work this year bought me Christmassy oven gloves which are perfect for me. As I passed my driving test this year, my friend Danielle bought me a Yankee Candle car jar, which I can’t wait to put in my car. Rhys also bought me a few stocking fillers alongside my GoPro. First of all he bought me a Chewbacca pop vinyl, but one of the new ones holding Porg so I’m even more thrilled about it. He also bought me a Grumpy mug and socks set, both donning the phrase ‘Back off I’m Grumpy’ which could either be for my love of Disney or a hint about my personality haha. 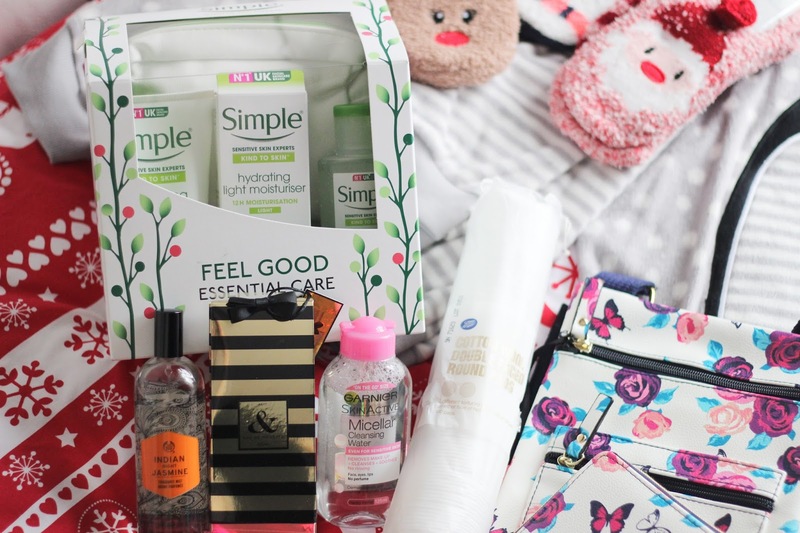 I am a huge fan of skincare and my skincare routine, so was happy to receive a Simple skincare set from my friend Marnie, and a mini of my favourite micellar water from Katy, alongside some cotton pads to use with it. This year I’ve ran out of most of my make up and fragrance, so I was happy to receive some under the tree. Emily bought me Indian Jasmine body mist from The Body Shop, which smells so lovely. Chloe bought me a lovely Next fragrance, which I can’t wait to use. 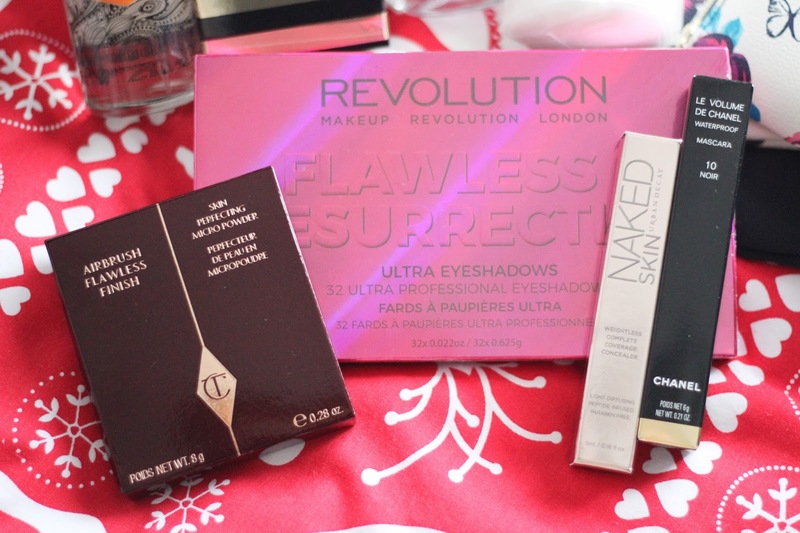 I received my first Make Up Revolution product in the form of the Flawless Resurrection eyeshadow palette from Danielle, which I’ve heard so much about and can’t wait to use it. Finally my Mom gave me my favourite Chanel mascara, Le Volume de Chanel and my favourite Urban Decay Naked Skin Concealer, as well as a new Charlotte Tilbury powder to try. A few gifts weren’t included in this post because I’d started using them or couldn’t get a decent photograph of them in the dark! Thank you to everyone that bought me a gift or wished me a Merry Christmas, I appreciate it so much.